Before opening up a new credit card from one of your favorite stores, it’s important to keep in mind how they can affect your credit score. Applying for store credit cards can have either a positive or negative effect on your credit. To help you understand the impact, we spoke with our credit specialists behind our sister company Rocket HQ. Rocket HQ specializes in helping people understand what’s on their credit report. It also provided us with some of the pros and cons of opening up store credit cards. Rocket HQ identified a few advantages for applying for a store credit card. When you’re offered at the checkout to open a store credit card, don’t automatically assume it’s a bad idea. If you don’t have a credit history, opening one will help you begin to build your credit history. 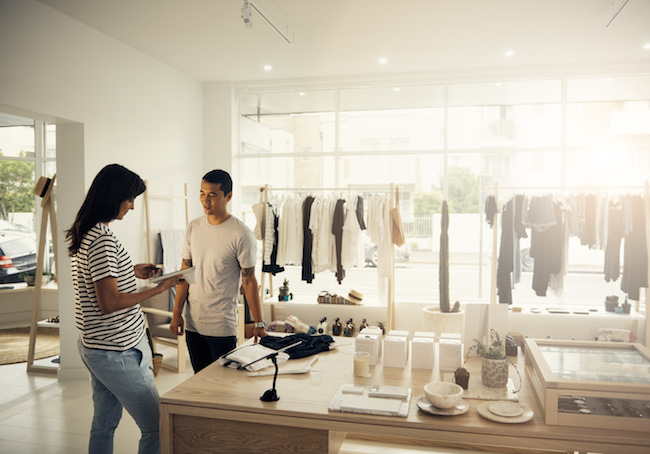 If you’ve never taken out a loan or line of credit before, opening up a store credit card, paying your payments on time and keeping your utilization under 30% will help you establish good credit. Paying off your store credit card on time could help prove that you’re responsible with your money, which will help increase your credit history as time passes. By establishing your credit, you might be able to qualify for lower interest rates. For example, if you’re looking to buy a home, your credit history could help you save thousands of dollars on a mortgage by locking the lowest rate possible. Many stores offer perks, like loyalty points, discounts or money back, on items you’re already planning to buy. Getting a store credit card for a place you shop at regularly will help you get bonus coupons and special deals in the future. As long as you pay your bill in full each month, this will save you money on purchases you were already planning to make. Before applying for a store credit card, our partners at Rocket HQ also pointed out some disadvantages. Applying for a credit card can temporarily hurt your credit score, which is particularly noteworthy if you’re in the market to get a mortgage. All lenders do a hard pull on your credit, which will lower your credit score for the time being. Getting that score back up will take months of paying your bill on time but will lead to a positive credit history. Also, applying for too many store credit cards can negatively impact your score. So keep tabs on how many you’re opening to avoid this small impact from turning into a large one. One of the major cons of opening up a store credit card is that they generally have higher interest rates than bank credit cards have. If you pay your balance on time and in full, this will not impact you. But, if you can’t pay in full, you might end up paying more in interest over the long run than you would’ve if you had used a non-store specific credit card or cash. Store credit cards often have low credit limits – meaning you’re not able to spend a lot of money. But spending less money isn’t always a positive thing for your credit score. With a low credit limit, it’s easy to have a higher credit utilization ratio (how much debt you have on the card relative to the credit limit), which can negatively influence your credit score if this ratio is greater than 30%. Ciele Edwards, credit specialist and finance expert, authored the article “Does a Low Credit Card Limit Hurt Your Score?” where she recommends that you want to have a low credit-utilization ratio so you’ll have a higher credit score – making you less of a financial risk to lenders. Remember, if you open up a store credit card, keep in mind the precautions listed above. And make sure you pay all your bills in full and on time so you can build your credit score. If you’ve already gone into debt and are looking to consolidate your store credit cards balance, Rocket Loans (by our parent company, Rock Holdings Inc.) is an efficient way for you to apply for and receive full funding for personal loans without lengthy delays often equivalent with personal lending.